Power Shares Series: Game. Set. Inspire. Seeing that the ground is covered with snow, the temperature is below freezing and the only thing I want to do is curl up with a good book and a hot cup of cocoa, it’s surprising that I recently got inspired BIG TIME through a sport that’s normally played in anything but ice and snow: tennis. A month or so ago, my parents mentioned that they were interested in seeing the Power Shares Series when it came to town, and, well, would Ryan and I be interested in joining them? Heck yeah! But, honestly, I didn’t know what to expect. It had been 15 years or so since I’d seen tennis live, and I’d never been to a tournament of champions type of event like this before. Would it be fun? Would we see good tennis? Would anyone show — especially since we got 9-inches of snow the day before? I had no idea. But, we loaded up in my dad’s truck and headed downtown for our tennis adventure. And what an adventure it was! The event ended up being a mini tournament of sorts. Michael Chang and Jim Courier played each other first, then John McEnroe and Ivan Lendl battled it out. The winners — who each won their one set game (advantage scoring) — then played each other. 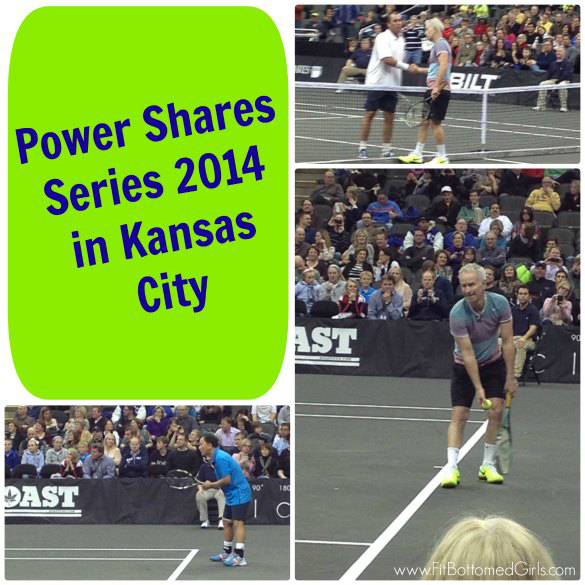 For our event, Michael Chang and John McEnroe played each other, with John McEnroe winning it all. Now, watching tennis live is fun because you can see just how hard the pros hit the ball and the amazing angles that they hit. But in this event, it was just cool to see such huge tennis stars go head to head. I mean, I’ve been watching these guys slug it out since I was a little girl. And while they clearly had fun with it all, they also got serious. In his first round, Johnny Mac was cracking jokes and even messing with the umpire a bit (see a little video from the event here), which was totally entertaining. But, once things got tight in the score, there’s no doubt that these guys were playing to win. I saw fabulous serves and shots that were truly jaw-dropping. And, um, let’s not forget that these guys are over 40. Jim Courier was the youngest of the bunch at 43, but John McEnroe is 54. Fifty-four! And here they are, years after their “prime,” out there still dying to win and hitting amazing shots. I left that evening not only being entertained but being truly moved by the spirit of a champion. Sure, they retired, but their desire to do their best and to win hasn’t faded. They were still taking risks, going after shots, running down balls and having a damn good time in the process. Just goes to show you — again — that you’re only as old as you feel. And, more importantly, as old as you play.